Tabib Toxic Waste Services Ltd has purchased a second Tiger handheld photoionisation detector (PID) from Ion Science (www.ionscience.com) – leading specialist in gas detection instrumentation for global occupational health and environmental monitoring applications – to ensure the safe export of hazardous waste from a new hazardous waste transfer station in Israel. Tabib, which repackages and exports hazardous waste materials, is using the intrinsically safe TigerLT instrument to monitor levels of volatile organic compounds (VOCs) in box containers before they are sent to Europe. Tabib provides comprehensive solutions for all types of waste, from the generation phase to the delivery of waste to its final destination. Since the company was established in 1992, it has become a leader in its field, thanks to the increased awareness of environmental issues and increased enforcement of environmental laws in Israel. Daniel Stern, Chemistry Technologist at Tabib Toxic Waste Services comments: “Tabib holds an export license for recycling, treating and destroying all types of hazardous waste, in line with the Basel Convention. This means we are authorised by Israel’s Ministry of Environmental Protection to export toxic waste for treatment abroad. We have treatment and destruction facilities outside of Israel that specialise in all types of hazardous waste. “With the opening of a new hazardous waste transfer facility, we required another PID to monitor VOC levels in box containers being exported to Europe. Our existing Ion Science Tiger VOC detector has proved reliable, accurate and trouble-free so it made sense to use the same brand. 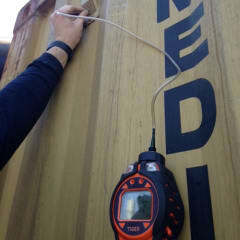 Tabib’s skilled chemists are using the TigerLT on a daily basis to check box containers of hazardous waste before they are sent to the port from the waste transfer station. The results are recorded within containerisation reports. Ideal for conducting environmental surveys, the handheld TigerLT boasts a detection range of 0.1 - 5,000 parts per million (ppm). It utilises a standard two-point calibration protocol and offers an unrivalled industry response time of just two seconds and equally quick clear down. Both simple to operate and service, the TigerLT allows easy access to the lamp and sensor and the safe replacement of batteries in hazardous environments. The intrinsically safe instrument also meets ATEX, IECEx, UL and CSA standards. The TigerLT six pin MiniPID detector cell with anti-contamination design dramatically extends run time in the field. Low cost filters and lamps can be easily changed in minutes, minimising downtime. This instrument also features long life rechargeable Li-ion batteries which give up to 24 hours usage. Fast battery charging allows the instrument to be fully charged in 6.5 hours, while eight hours of use can be achieved from 1.5 hours of charging time. TigerLT features a protective, removable boot for harsh environments while a large, clear back-lit display allows for easy viewing in any light condition. It is IP 65 rated against water ingress. An integrated torch is designed for directing the instrument’s probe into dimly lit areas. Other features include a loud 95 dB audible alarm and multiple language support. It also has push to log data log option.